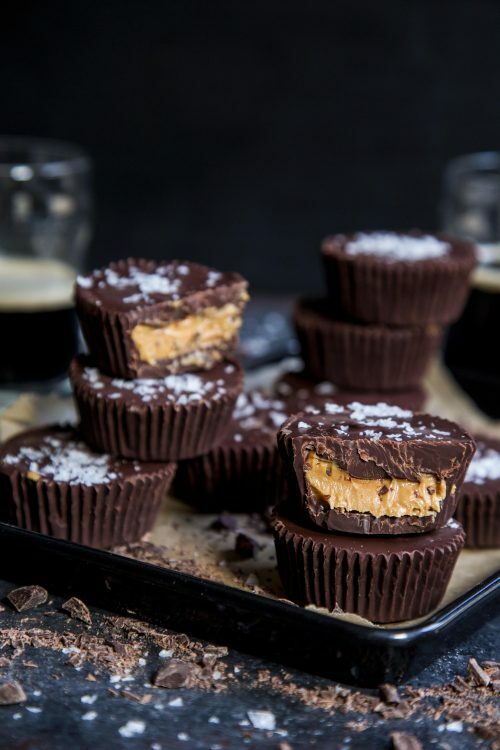 Dark Chocolate Peanut Butter Guinness Cups are a festive treat to make to celebrate St. Paddy’s Day! Until you can sport all things green. And yes, that includes your unmentionables. Are you ready? I kind of feel ready. I should state for the record that I am less than one percent Irish. Wait. Does that even matter when you’re celebrating St. Paddy’s? I kind feel it’s just one giant hot tub party and everyone is invited. What’s the etiquette here? Either way I am ready. I unearthed my “Kiss Me I’m a Wildcat” t-shirt from my ol’ college glory days. Bonus: still fits. Phew. I also found a bunch of green plastic necklaces….well, you can guess what those were for. I might just put those back in the plastic tub. Moving on. Also, I’ve been on a Guinness cooking/baking kick. I made these Guinness and Black Bean Loaded Spiralized Fries for the blog last week. 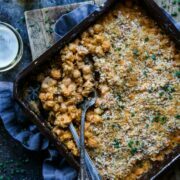 I also whipped up some Guinness Beef Skillet Mac & Cheese and Guinness Chocolate Quinoa Bark with Whiskey Ganache while Mr. B was out of town. Question: Is it weird that I don’t actually like to drink a bottle of Guinness? I would much rather cook or bake using the dark lager. Discuss amongst yourselves. 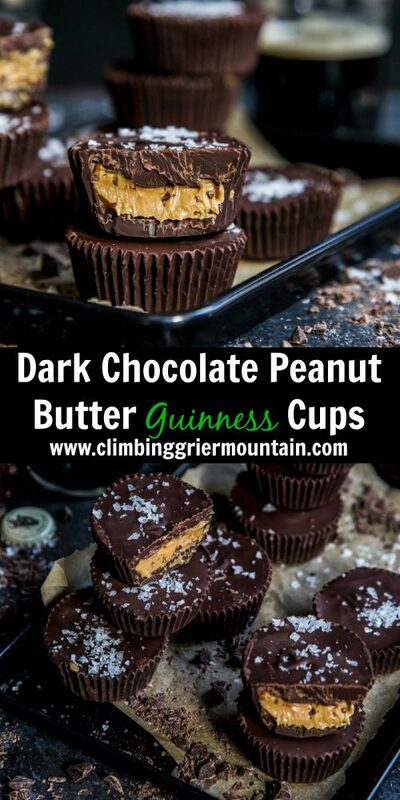 The point to all this Guinness use is that I made these Dark Chocolate Peanut Butter Guinness Cups and they are lights out brilliant. 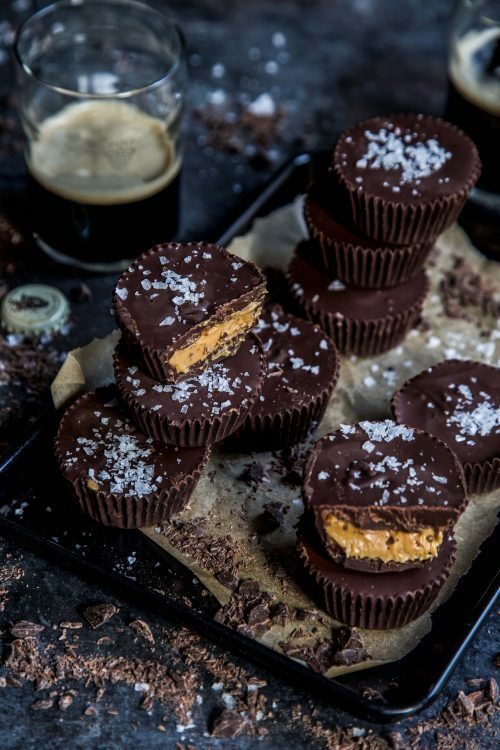 First, who doesn’t love a dark chocolate peanut butter cup? 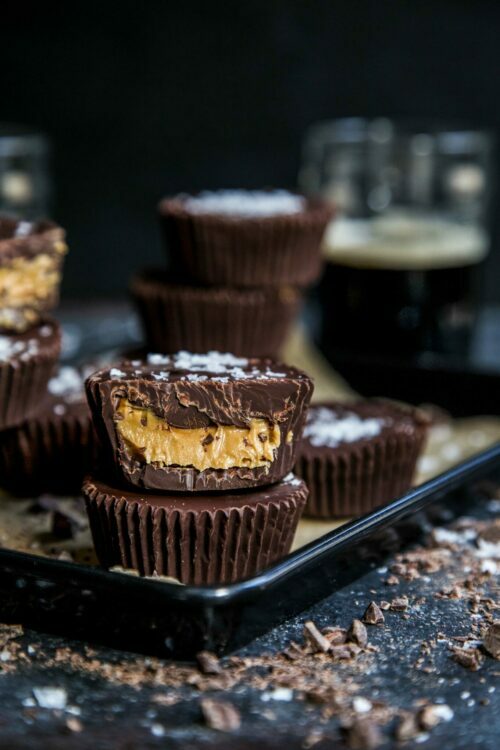 Second, who doesn’t love a dark chocolate peanut butter cup with booze? I rest my case. 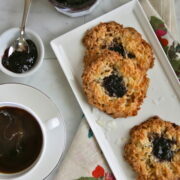 These decadent gems are super easy and are a great treat to make to celebrate St. Paddy’s Day. Irish decent not required to consume. Line a 12-cup muffing pan with muffin liners and set it aside. Bring a medium saucepan filled with about 2 to 3 inches of water to a boil. In a medium mixing bowl, add 2 cups dark chocolate chips and 2 tbsp Guinness. Set the bowl over the saucepan, making sure the bottom is not touching the water, and stir the chocolate and Guinness until it is melted and smooth, about 1 minute. Next, take 1 tbsp of the melted chocolate and place it into the bottom of each muffin liner. Using a pastry brush, brush some of the chocolate up the sides of the liner about three-quarters of the way. It will look thin, but once the chocolate sets it will look just right. Once all the liners have been filled, place the muffin pan into the fridge to set for about 30 to 40 minutes. 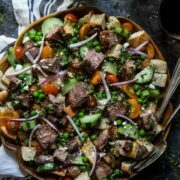 Take the muffin pan out of the fridge and place it on the countertop. 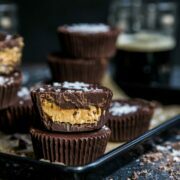 Next, take 1 tbsp of the peanut butter and place it into the center of each chocolate cup. Press down on the peanut butter making sure it’s flat and smooth. Place the muffin pan back into the fridge for another 5 to 10 minutes. While the mixture sets, melt the remaining 1 cup of dark chocolate chips along with 1 tbsp Guinness. Once it’s melted, remove the bowl from the saucepan and set it aside. Next, remove the muffin pan from the fridge. Spoon a tablespoon of the melted chocolate over the peanut butter. Repeat process until all the cups have been covered. 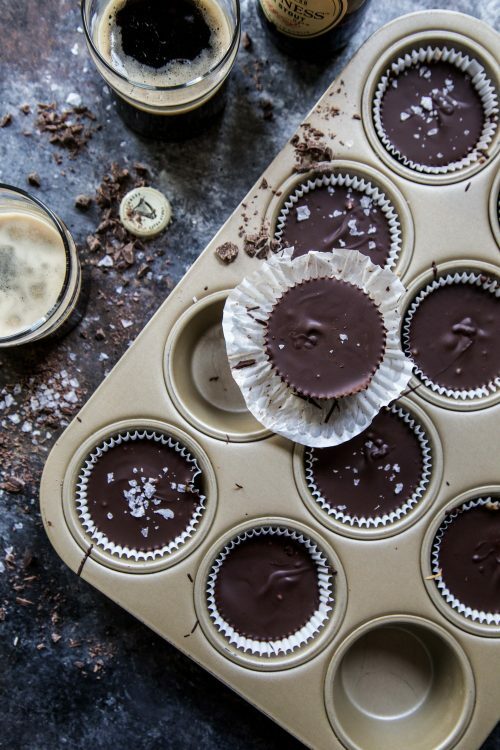 Place the muffin pan into the fridge again and let the chocolate set for about 15 minutes. Once the chocolate is set, remove the muffin pan from the fridge. 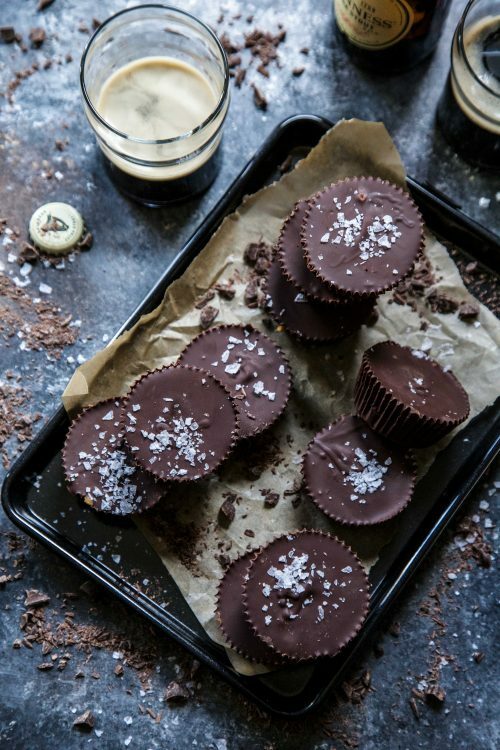 Remove the muffin liner from the chocolate cup, sprinkle with sea salt if desired, and enjoy! I’ll take this and whatever Guinness you still have in your fridge!! Looks AMAZING Lauren! I cannot express how much I want one of these right now. 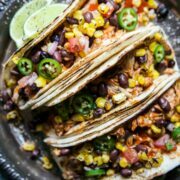 YUM!!!!!! The chocolate looks very tasty and tempting to eat, I’ll try to make it. Thank you for sharing.